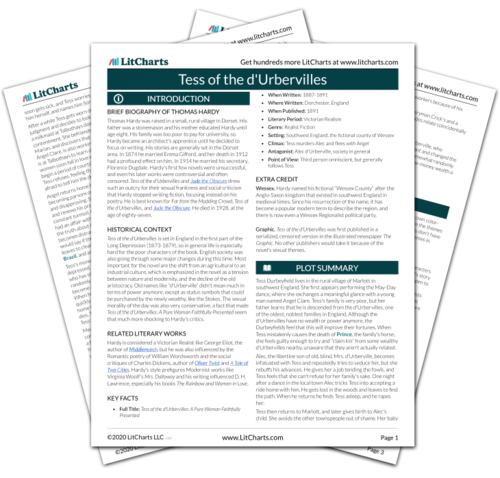 Instant downloads of all 945 LitChart PDFs (including Tess of the d'Urbervilles). Looks like you're viewing this page on a mobile device. The Tess of the d'Urbervilles Theme Wheel is a beautiful super helpful visualization of where the themes occur throughout the text. They're only accessible on tablets, laptops, or desktop computers, so check them out on a compatible device. The Theme Wheel visualizes all of Tess of the d'Urbervilles's themes and plot points on one page. 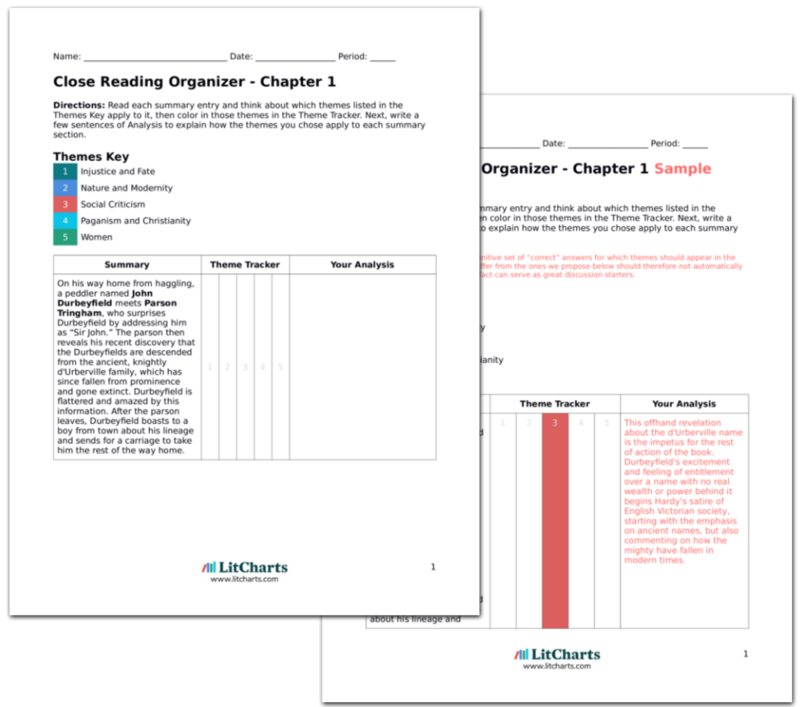 LitCharts assigns a color and icon to each theme. Select any of the themes in the key below to highlight it in the Theme Wheel. How does the Theme Wheel work? Each wedge of the blue ring represents a chapter. Each row of colored boxes extending from a wedge represents a part of the chapter. The closer to the blue ring, the closer to the beginning of the chapter. The colors in each row indicate which themes are “active” in that part of the chapter. The Theme Wheel is interactive. Themes: Hover over or tap any of the themes in the Themes and Colors Key to show only that theme. Click a theme in the Themes Key to lock it. Summary: Hover over or tap any row of colored boxes to read the summary associated with that row. Click the row to lock the summary. Cosby, Matt. "Tess of the d'Urbervilles Theme Wheel." LitCharts. LitCharts LLC, 3 Nov 2013. Web. 23 Apr 2019. Cosby, Matt. "Tess of the d'Urbervilles Theme Wheel." LitCharts LLC, November 3, 2013. Retrieved April 23, 2019. https://www.litcharts.com/lit/tess-of-the-d-urbervilles/chart-board-visualization.